I have recently added this portrait of George Griffiths to the Artworks of Mary E. Hutchinson at http://meh.omeka.net. 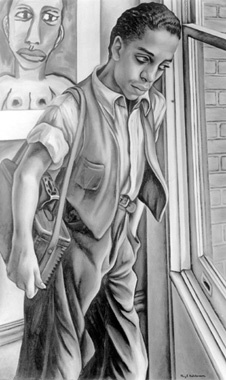 It is one in a series of paintings made by Hutchinson in 1936-37 of Griffiths who she probably encountered at the Harlem Community Art Center where she worked for the Federal Art Project. The title of this work is probably either “George” of “Shine Boy” or it seems likely that Hutchinson exhibited the painting twice under the two different titles. I am currently researching and thinking through issues of mid-twentieth century cross racial representation and would love to hear from others working on this issue. I’m happy to report that my neighbor owns this painting! I’m a curator at the National Gallery of Art, in Washington, DC and I offered to do a little research for her about her painting. I came across your site. Can you email me so that I can send you a color pic of it? I don’t see another way to reach you. Thanks in advance. « Mary E. Hutchinson’s “Cat” Sold at Auction! You are currently reading Mary E. Hutchinson’s “George” or “Shine Boy” at Jae Turner.